Kinshasa School of Public Health, Faculty of Medicine, University of Kinshasa, Kinshasa, Democratic Republic of the Congo (DRC). Ministry of Public Health, Kinshasa, DRC. Lubumbashi School of Public Health, Faculty of Medicine, University of Lubumbashi, Lubumbashi, DRC. Methods: Data were collected for the cross-sectional study from April 2014 to June 2014 by the Ministry of Public Health. A total of 1,568 health facilities that reported data to the National Health Information System were selected by multistage random sampling in the 11 provinces of the DRC existing at that time. Data were collected through interviews, document review, and direct observation. Two dependent variables were measured: availability of family planning services (consisting of a room for services, staff assigned to family planning, and evidence of client use of family planning) and quality of family planning services (assessed as “high” if the facility had at least 1 trained staff member, family planning service delivery guidelines, at least 3 types of methods, and a sphygmomanometer, or “low” if the facility did not meet any of these 4 criteria). Pearson's chi-square test and odds ratios (ORs) were used to test for significant associations, using the alpha significance level of .05. Results: We successfully surveyed 1,555 facilities (99.2%) of those included in the sample. One in every 3 facilities (33%) offered family planning services as assessed by the index of availability, of which 20% met all 4 criteria for providing high-quality services. Availability was greatest at the highest level of the health system (hospitals) and decreased incrementally with each health system level, with disparities between provinces and urban and rural areas. Facilities in urban areas were more likely than in rural areas to meet the standard for high-quality services (P<.001). Public facilities were less likely than private facilities to have high-quality services (P=.02). 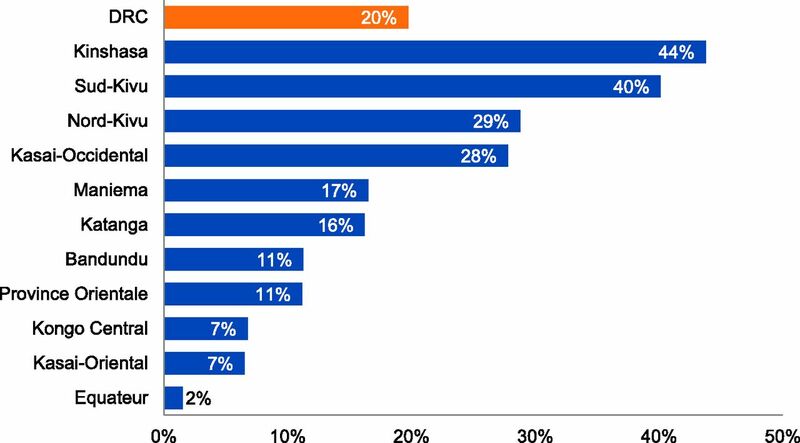 Among all 1,555 facilities surveyed, 14% had at least 3 types of methods available at the time of the survey; the most widely available methods were male condoms, combined oral contraceptive pills, and progestin-only injectable contraceptives. Family planning is one of the most cost-effective interventions to improve maternal and child health outcomes. To date, no study has been conducted at the national level on the availability and quality of family planning services in the DRC—a major logistical feat given the physical expanse and poor transportation infrastructure of the country. The objective of this study was to determine the availability of family planning services within health facilities throughout the country and to assess their quality. The objective of this study was to determine the availability and assess the quality of family planning services in health facilities throughout the DRC. To be eligible for inclusion in this study, the facility had to be listed on the Ministry of Public Health roster of facilities and to have provided data to the National Health Information System (NHIS, known locally as SNIS) during the 6 months prior to the study as an indication that it was active. In view of the vast geographical expanse of the DRC and logistical challenges to collecting data, the research team divided the country into 38 “pools” corresponding to the major urban centers. The team contacted provincial health officials to determine the means of access to each selected facility and the resources needed to reach it. The index of family planning availability was based on 3 criteria: infrastructure, staff, and service use. 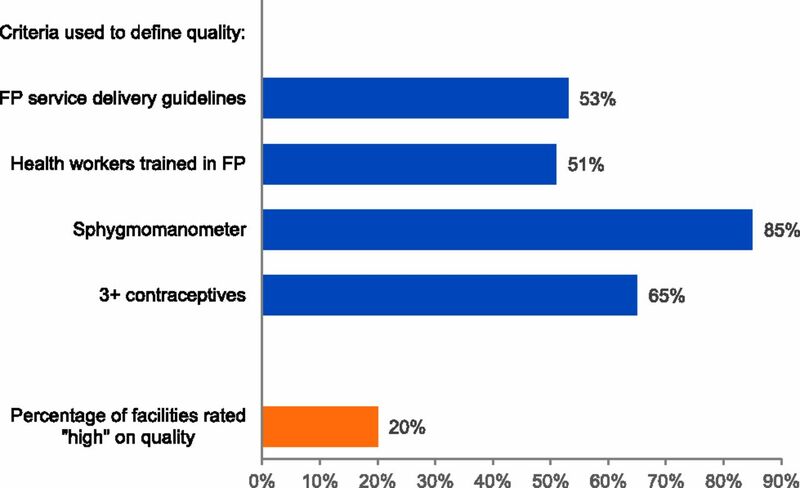 The index of quality was based on 4 elements: presence of 1+ trained staff, existence of family planning service delivery guidelines, availability of 3+ methods, and availability of a sphygmomanometer. These elements focused mostly on Donabedian's first dimension of quality care, which is focused on structure of care. Donabedian's second dimension, standards of care, was captured in our index by observing whether family planning service delivery guidelines existed. Since the elements included in our index comprised a modest measure of quality, only facilities that met all 4 of the criteria were classified as having “high” quality; if 1 or more of the criteria were not met, the facility was assessed as having “low” quality. Independent variables included the health facility sector (public versus private), location of the facility (urban versus rural), type of facility (hospital, referral health center, health center, or health post), and province. Before carrying out statistical analyses, all non-state health facilities were grouped under the category “private,” which included private for-profit facilities, not-for-profit facilities, and church-managed facilities. Prior to 2015, the DRC had 11 provinces. In 2015, the provinces were further subdivided for a total of 26 provinces. This analysis is based on the 11 provinces in existence at the time of data collection. Within each of the 38 pools, 2 staff from health facilities not selected for the study were recruited and trained by supervisors from Kinshasa as interviewers for the study. They visited all facilities selected for inclusion in that pool and collected data through structured interviews with managers and the person responsible for family planning services of health facilities. The first interviewer asked the questions and recorded the answers on a paper form while the second interviewer simultaneously recorded the information on an electronic form on a laptop computer. After the interview was completed, the 2 interviewers resolved any discrepancies between the paper and electronic forms. The interviewers also performed document review and directly observed conditions in the facilities (i.e., counting contraceptive products in stock, analyzing contraceptive use registers, availability of service delivery guidelines, and appearance of the consultation room). Supervisors revisited 10% of the facilities to validate the data. Data were entered using CSPro 5.0, using double entry for quality control. All data were weighted by stratum before analysis. The data were then exported to Microsoft Excel 2010 to produce graphs and charts. SPSS Statistics version 21.0 and WINPEPI version 11.54 were used for analysis and testing of associations. The indices of availability of family planning and quality of services were calculated as a proportion of all facilities. Pearson's chi-square test or the Fisher exact test were used to test the association of different variables. The odds ratios (ORs) helped to measure the effect size of specific associations. All hypotheses were tested using the alpha significance level of .05. The study was reviewed and approved by the Ethics (Human Subjects) National Committee. The research team obtained authorizations from national and provincial health authorities prior to the survey. Data were collected anonymously, after obtaining informed consent from participants. In total, 1,555 facilities of the 1,568 included in the sample (99.2%) were successfully surveyed across the 11 former provinces of the DRC. The 13 health facilities for which data were not collected were extremely difficult to access, with some requiring use of a motorized canoe. Of the 1,555 facilities surveyed, 33.0% offered family planning services, as assessed by the index of availability (i.e., availability of a room for family planning service provision, existence of staff assigned to family planning services, and evidence of client use of family planning services from service statistics) (Table 1). Hospitals were more likely to offer family planning (53.1%) than referral health centers (38.5%), health centers (31.1%), or health posts (8.9%). This relationship was statistically significant (P<.001). Availability of family planning was also significantly higher in urban areas than in rural areas (P=.02). By contrast, there was no relationship between the availability of family planning and whether the facility was in the public or private sector (P=.37). Only 33% of surveyed facilities offered family planning services, as assessed by the index of availability. As shown in Figure 1, family planning service availability was unevenly distributed across the country. The provinces with the highest percentages were Sud-Kivu (81%) and Nord-Kivu (60%), in contrast to the lowest percentages in province Orientale (15%), Bandundu (18%), Equateur (21%), and Kongo Central (28%). The bars in Figure 1 also indicate the percentage of facilities at the national level and in each province with 3 or more methods available (indicating greater choice) versus fewer than 3 methods. At the national level, of the 33% of facilities with family planning services, more had fewer than 3 methods (19%) while a few number of facilities had 3+ methods (14%). Sud Kivu and Nord Kivu had the highest percentage of facilities with 3+ methods, in stark contrast to Bandundu, Equateur, and Province Orientale (with 5% of health facilities or less having 3+ methods). Family planning service availability was unevenly distributed across the country. The relative availability of different contraceptive methods is evident from Figure 2. Based on the total of 1,555 facilities surveyed, the 3 most commonly available methods were condoms (28%), combined oral contraceptives (23%), and injectables (19%). Methods available in less than 10% of facilities were the intrauterine device (IUD), emergency contraception, and female and male sterilization. The availability of specific methods was higher in private than public facilities for implants, IUDs, emergency contraception, and female sterilization, but not significantly different for other methods (data not shown). a Data are based on the full sample of 1,555 health facilities surveyed, not the subset that had family planning services available as defined by the index of availability. The 3 most commonly available methods available were condoms, combined oral contraceptives, and injectables. In this analysis, we developed a quality index based on 4 items for the 513 health facilities with family planning services available. As shown in Figure 3, just over half of these health facilities had service delivery guidelines (53%) and staff trained in family planning (51%). The large majority (85%) had a sphygmomanometer in good condition, and about 65% had at minimum male condoms, combined oral contraceptive pills, and injectable contraceptives available. However, only 1 of every 5 health facilities (20%) met all 4 quality criteria and thus met the standard of having a “high” quality of family planning services. Only 20% of facilities were assessed as having high-quality family planning services. The quality findings show marked differences by province (Figure 4). The facilities with the highest percentages offering high-quality family planning services were in Kinshasa (44%), Sud-Kivu (40%), Nord-Kivu (29%) and Kasai-Occidental (28%). By contrast, in the remaining provinces, 17% of facilities or less were judged to be of high quality. a Facilities were assessed as providing high-quality family planning services if they met all 4 criteria of the quality index: (1) availability of at least 1 staff trained in family planning in the prior 2 years; (2) existence of service delivery guidelines in family planning; (3) availability of, at minimum, male condoms, combined oral contraceptive pills, and injectables; and (4) availability of a sphygmomanometer. According to the results in Table 2, the percentage of health facilities assessed to have high quality of family planning services was significantly higher for urban (35.1%) than rural areas (14.8%). It was also significantly higher among private health facilities (25.0%) than public (16.4%). Finally, quality was highest among hospitals (27.5%) and lowest among health centers (14.8%) and health posts (0.0%). The number of methods available is important in family planning services because it serves as a proxy for the choice that clients have (more being better). The 513 facilities with family planning services available had a mean number of 3.0 methods available (Table 3). The number was higher for referral health centers (4.9) and national or provincial hospitals (4.7) than for health centers or posts (1.6). The 513 facilities with family planning services available had a mean number of 3 methods available. This study demonstrates the acute lack of access to quality family planning services in the DRC. Unmet need for family planning in the DRC is high among both women in union and sexually active women not in union.4,33 The low availability and quality of family planning services found in this study highlights the need for the country to improve access to and availability of services to better meet the demand for family planning. In addition, we found that family planning services are more available in hospitals than in health centers and in urban than rural areas in the DRC. These differences could explain the persistence of low modern contraceptive prevalence of 8% in the country, with significant disparities between urban (15%) and rural areas (5%) and between provinces.4,32 In the DRC, the majority of the population lives in rural areas where health care is mainly provided through health centers. In this study, the majority of the provinces which had a higher percentage of facilities with family planning service (Sud-Kivu, Nord-Kivu, Katanga, Maniema, Kinshasa, and Kasai-Oriental) are among those that have a large number of urban cities. Family planning services are more available in hospitals than in health centers and in urban than rural areas in the DRC. The National Multisectorial Strategic Plan for Family Planning 2014–2020 in the DRC defines the quality of family planning service as “high” when a health facility has at least 1 staff trained in family planning and provides a varied range of contraceptive methods, specifically at least 3 types of contraceptive methods comprising 1 long-acting method, 1 short-acting method, and 1 natural method.26 When looking specifically at the number of methods available, we found that 14% of all health facilities surveyed in our study had at least 3 types of contraceptive methods; although the 3 minimum methods defined in our study were all short-acting methods (condoms, pills, and injectables), this definition is consistent with the standards proposed by the National Program of Reproductive Health.34 Although this figure is low, it seems that progress has nevertheless been made over the past 2 years, with the percentage of health facilities offering at least 3 types of contraceptive methods increasing from 6% in the 2012 mapping study32 to 14% in our study. We also showed that facilities in urban areas are more likely than those in rural areas to meet the quality standard, as are private facilities compared with public facilities. The quality of family planning deteriorated when moving down the health system chain, from hospitals to health posts. These results are consistent with those found in the multicenter study by Hutchinson et al. in Ghana, Kenya, and Tanzania, which showed that the quality of the family planning offered by private providers was better than that offered by public providers,23 particularly when comparing primary-level health facilities. Private health facility users liked the short waiting times and infrequent shortages of inputs.22,23 These results corroborate the finding that health services that are under the direct responsibility of public administrations often raise problems of poor resource management. Facilities in urban areas are more likely than those in rural areas to meet the quality standard, as are private facilities compared with public facilities. Kayembe et al. reported in 2015 that the capability of health facilities in Kinshasa, the capital city of the DRC, to provide quality family planning services had improved between 2012 and 2013, with clinics offering higher-quality family planning services than hospitals and health centers.38 The number of years in operation and the number of available methods were linked to these improvements. In our study, there were overall few clinics integrated into the NHIS, resulting in a small sample size. Based on our numbers, we found that only 44% of health facilities in Kinshasa met the quality standard, compared with 68% of clinics in the Kayembe report. The difference is likely due to differences in the way quality was measured between the 2 studies and in different sampling approaches. Low availability and quality of family planning are among the main reasons for the low contraceptive prevalence in the DRC, but not the only reasons. Demand for family planning among the population also needs to be taken into account. For example, the majority of the population in the DRC is influenced by religious leaders who often are opposed to family planning. Moreover, in developing countries overall and in the DRC specifically, many people hold “pronatalist” views and are therefore hesitant to use family planning. To improve access to and use of family planning, health officials need to address both supply and demand considerations. This study is the first to assess progress toward increasing access to and quality of family planning services on a national scale in the DRC. Also, it was methodologically stronger than the previous 2012 stakeholder mapping because of the sampling technique used, which involved stratification by province and type of health facility leading to greater representativeness of all types of health facilities. In addition, one of the strengths of this study is that it used a systematic sampling strategy and collected data representing the whole country despite important challenges in this context. Data collection for this study covered approximately 10% of health facilities integrated into the NHIS of the DRC. The main limitation is that the sampling excluded health facilities not integrated into the NHIS, which could have led to selection bias, leading to an overestimation of family planning service availability and quality. However, we believe facilities not reporting to the NHIS receive less support and thus the availability and quality of family planning services is likely to be poor. On the other hand, we did not consider certain practices, such as the use of hangars for family planning service provision (an outside location with only a roof overhead), in our index of availability of family planning services because confidentiality and privacy of the clients would be difficult, if not impossible, under these circumstances. In addition, pharmacies—the major source of contraception in the 2007 and 2013–14 DHS studies—were excluded from this study. These facts may have resulted in an underestimation of family planning service availability. Finally, the measurement of quality was based on the availability of pills, condoms, and injectables, because they were the most widely reported methods; in contrast, other studies of this type base the measure of “at least 3 methods” on the availability of any type of modern method. Availability and quality of family planning services in the DRC remain low. Family planning services are inequitably distributed throughout the country, with better availability in urban than rural areas and with significant differences in availability between provinces. Although efforts have been made to improve the availability of family planning services in selected rural areas, given the vast number of rural health zones that are still lacking family planning interventions, services are more available in urban areas than in rural areas where the majority of the population lives. Private health facilities are likely to provide better quality family planning services than public health facilities. Health authorities should work toward strengthening public-private partnerships to achieve improved access to and quality of care in family planning services. We want to thank national health authorities from the Ministry of Public Health of the DRC who have involved us in every step that led to the preparation, data collection, and production of the final report on the Availability and Operational Capacity of Health Services in the Democratic Republic of the Congo. They also allowed us to use the database and perform secondary analyses focused on family planning. We thank all international organizations (WHO, GAVI Alliance, and the Global Fund) that provided technical, logistical, and financial support for the completion of this study. We also thank the staffs who were involved in the collection and analysis of data from the study. Special thanks to Dr. Jane Bertrand who assisted in editing previous versions of this manuscript. World Health Organization (WHO), UNICEF, UNFPA, World Bank. Trends in Maternal Mortality:1990 to 2015: Estimates by WHO, UNICEF, UNFPA, World Bank Group and the United Nations Population Division. Geneva: WHO; 2015. http://www.who.int/reproductivehealth/publications/monitoring/maternal-mortality-2015/en/. Accessed May 24, 2017.
. Levels and trends in child mortality: report 2015. Estimates developed by the UN Inter-agency Group for Child Mortality Estimation. http://www.childmortality.org/files_v20/download/IGME%20report%202015%20child%20mortality%20final.pdf. Published 2015. Accessed May 24, 2017. UNICEF. Committing to Child Survival: A Promise Renewed. Progress Report 2015. New York: UNICEF; 2015. https://www.unicef.org/publications/files/APR_2015_9_Sep_15.pdf. Accessed May 25, 2017. Ministère du Plan et Suivi de la Mise en Œuvre de la Révolution de la Modernité (MPSMRM); Ministère de la Santé Publique (MSP); ICF International. Enquête démographique et de santé en République Démocratique du Congo 2013–2014. Rockville, Maryland: MPSMRM, MSP, and ICF International; 2014. https://dhsprogram.com/pubs/pdf/FR300/FR300.pdf. Accessed May 24, 2017.
, eds. Réduire les barrières financières aux soins obstétricaux dans les pays à faibles ressources. Studies in Health Services Organisation & Policy, 25. Antwerp, Belgium: ITGPress; 2008. Fond des Nations Unies pour les Populations. Etat de la population mondiale en 2005. Rapport annuel. New York: UNFPA; 2005. République Démocratique du Congo (RDC). Planification familiale: plan stratégique national à vision multisectorielle 2014–2020. Kinshasa: RDC; 2014. République Démocratique du Congo (RDC), Ministère de la Santé (MSP). Stratégie de renforcement du système de santé. 2ème éd. Kinshasa: MSP; 2010. Ministère de la Santé, République Démocratique du Congo (RDC). Normes d'organisation des Zones de santé. Kinshasa: RDC; 2006. Ministère de la Santé Publique (MSP), République Démocratique du Congo (RDC). Enquête l'Enquête sur la Disponibilité et la capacité opérationnelle des services de santé en République Démocratique du Congo, DSSP/DSNIS. Kinshasa: MSP; 2014. World Health Organization (WHO), Health Statistics and Information Systems. Service Availability and Readiness Assessment (SARA): An Annual Monitoring System for Service Delivery. Geneva: WHO; 2015. http://www.who.int/healthinfo/systems/sara_reference_manual/en/. Accessed May 24, 2017. Ministère de la Santé Publique (MSP), République Démocratique du Congo (RDC). Cartographie des interventions et intervenants de la santé de la mère, du nouveau-né et de l'enfant y compris la planification familiale en RD Congo. Kinshasa: MSP; 2012. Ministère du Plan et Suivi de la Mise en Œuvre de la Révolution de la Modernité (MPSMRM); Ministère de la Santé Publique (MSP); ICF International. Enquête démographique et de santé en République Démocratique du Congo 2007. Rockville, Maryland: MPSMRM, MSP, and ICF International; 2007. http://www.aho.afro.who.int/profiles_information/images/4/46/RDC-EDS-RDC-2007-fr.pdf. Accessed May 24, 2017. Ministère de la Santé Publique (MSP), République Démocratique du Congo (RDC). Normes et directives sur la planification familiale. Kinshasa: MSP; 2012.